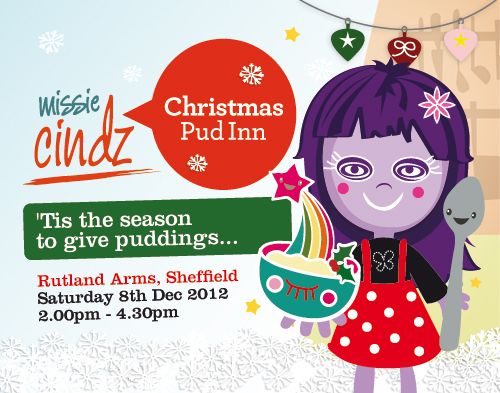 Christmas comes early on Saturday 8th December with our sell-out ‘Missie Cindz PudInn Club’ afternoon – giving you that delicious taste of Christmas in five sweet courses! We have five incredible Sheffield-based chefs and bakers to introduce who will be ready to serve PudInn diners beautiful homemade puddings which will capture the festive tastes of a season of merriment and bliss. I’ve been eagerly counting down the days! Like usual, diners have to wait until Saturday to find out what’s on their puddings menu, this will be revealed on the blog from 9.00am GMT – good things come to those who wait! :) here’s a clue, they’re Christmas-themed! and like usual we’ll have a PudInn quiz with delicious Cat Lane Bakery scones for our sweetest winners, PudInn Score Sheets, a Not-So-Secret Santa desserts table, plus you’ll be in good company; we have the Rutland Arms Chef Mike sitting in with us again – so if you have any baking or pudding questions, then he’s your man to ask! The winner will be picked at random and announced by the Rutland Arms LIVE on Twitter (@RutlandArms) and facebook on Monday 10th December at 9pm (21.00 GMT). If you’re not a Sheffield resident, we will send you your food voucher to redeem whenever you decide to visit us. If you would like to put your name on our waiting list or express your interest in future events then please sign up to our newsletter – where a colourful e-update with tasty news and happenings will be pinged into your inbox monthly or you can follow me on twitter and like our facebook page.